Simple and easy to install. Very nice design and the support team is gentle. Black, white and yellow are three colors that create an effective trio and make this design eye-catching. Black creates a solid background, white emphasizes the text against it, yellow is associated with intellect that is good for presenting the consulting sphere of business. 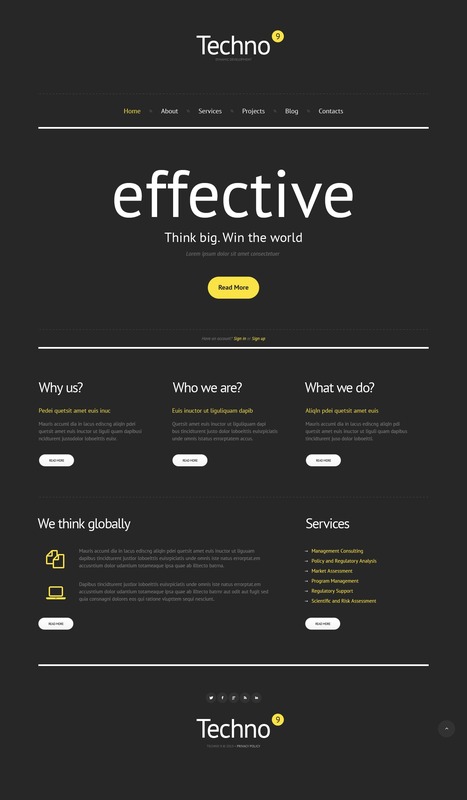 The slider in the top shows the key ideas of your business in effective way using large typography. The set of 6 pages with the wise division of the content part is enough for sharing all the information you have with the clients. My client really liked this one. But as the the implementer, I can say that the support provided by TemplateMonster is second to none. Any and all problems are resolved quickly. These guys rock! No hesitation about doing business with these folks. This is my 3rd purchase from template monster..as a returning customer, i am assured of the technical support and assistance from the staff..apart from that, the many different templates offered are of a wide range and i have a hard time to find the best because all looks equally good..what i like best from the template is due to its UI and theme..well constructed and even for newbie like me, i have no problem in figuring around myself. More praise should go to the support as i keep bothering them for questions and they never failed to answer and they are one of the main factor which make me goes back to purchase stuff from template monster..thank you! Easy to work with and straightforward design. Very nice layout and easy to follow instructions.